Howdy guys and gals. I apologize for the absence of a fishing report this past week. Fortunately, I’ve been busy on the water playing with some white perch and post spawn yellows. With the weather patterns we have had, it has produced a fairly early spawning run on the yellow perch. 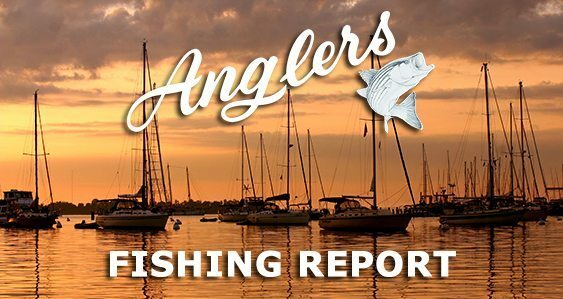 Areas such as Tuckahoe Creek, the Choptank River, Corsica, and the upper reaches of the Chester have produced an earlier than expected spawning run with high tides and water temperatures in the mid-50’s over a very short period of time. The good news, is that this was probably one of the best yellow perch runs I have ever seen (at least that I can remember) which would be hopeful to say, yellow perch numbers are up and with a successful spawn will continue to be good years to come. The bad news, is most bigger females are no longer in the areas you would find them 3 weeks ago (Hillsboro, Red Bridges, Centreville, Wye Mills, Crumpton, etc.). Now, that doesn’t mean they have gone forever until next year. All it takes is a Jon boat with your average fish finder and some time looking at a chart to figure out post spawn staging areas before they get into a spring feeding pattern. Shad darts, minnows, grass shrimp, night crawlers are all an effective method to pull post spawn yellows out as well as your typical Tony Acettas and Rooster Tails as the water temperature continues to climb. It is important to remember, these are purely a freshwater fish though they tolerate brackish waters so with that being said, you do not have to go in search of the entire bay to find them. Think crappie, logs, holes, structure, these all are good enough places to start. Now moving right along to the white perch, the western shore is predominantly done with the spawn run of whites. Though there are still some pre-spawn fish being caught along Wayson’s corner and the route 4 bridge, most of them are staging up and ready to move back out to post spawn locations. However, the eastern shore is just getting to a peak spawning run which means big females can be caught up at the headwaters of most creeks over the next few days, with most popular locations being Hillsboro, Tuckahoe State Park, and Red Bridges. In years past, I would have to say based on high waters from rain and a good high tide, we may be looking at a 4 to 5-day window to catch big whites in the skinny water which again isn’t the end of the road. Post spawn white perch can often be very fun to jig up with ¼ and ½ oz. Johnson Thinfishers over deep holes in river channels up to 15’ of water in ALL main rivers (Severn, Magothy, Chester, Chop tank, etc.). Now the fun has just begun for crappie fisherman in the tidal tributaries of the Blackwater River, Nanticoke, Chop tank, and so forth. Simple hook and a bobber rigs tipped with minnows are a age old favorite and can often yield a live well full of big crappie and post spawn yellow perch. Jumping to a horse of a different color, this is the time of year to catch big pickerel. Numerous reports, including my own trips to the Tuckahoe have proved to be great pickerel areas. Though an aggressive fish, there is definitely a method to continue to catch BIG pickerel which can vary one day to the next from Rattle Traps to Mepp’s spinners to small top water plugs if conditions are right. Most of the time this part of the spring we are catching them on shad darts and minnows and most of the time it’s an accident. I myself pulled 6 pickerel out of one pool of water in about 5 minutes on the Tuckahoe trying for some headwater yellow perch. What does that tell you? It should tell you to grab some spinners and rattle traps and go have a blast walking the river bank. Now, normally I don’t start spending nights on the creek catching channel cats until about May, until I had a good report out of the Severn River so my guys decided to put a trip together with some fresh cut white perch, night crawlers, clam snouts, and some fish finder rigs and see what the talk was about and come to find out. BIG channel cats were in abundance cruising the ledges off of brackish creeks and folks, it is not a science. Pick a good moving tide (I generally seem to do better on an outgoing for reasons unknown, maybe the debris floating downriver?) and some cut bait on fish finder rigs on your favorite bass rod with about 10 to 12lb test and go nuts. Though the fishing has been overall slow, the grade has been great and we have been able to pull out plenty of big channel cats up to 31”. As far as Stripers go, I can’t tell you any personal knowledge as I haven’t been as I’ve been pre-occupied with perch fries and baked catfish. However, the bay temp is up and the big fish are definitely here. The usual hotspots have been producing fish such as the Power plant along Calvert Cliffs and Thomas Point. As far as a troll bite, I have talked to a number of captains over the last few days here and have been pulling the legally allotted 6 rod spread for catch and release season with barbless hooks and have been pulling about 4 to 6 fish a trip out around Brickhouse south to 86(Bloody Pt.). As far as a bait selection goes, chartreuse tandems up to 14oz. has been the ticket over the last couple days which is likely to change given the day and tide and so forth. If you don’t have a boat and have cabin fever, I get it. So get up, grab a medium action surf rod, come grab some bloodworms and circle hooks and make a run down to Sandy Point for the afternoon or morning. 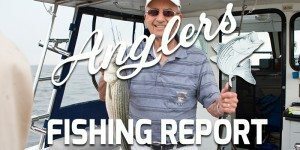 We have received numerous reports of rockfish being caught off the beach at Sandy Point up to 40” primarily on bloodworms. Hope that helps a little bit guys. As always stay safe, have fun, don’t do anything I wouldn’t do, and as always tight lines.